In response to the 11th five-year plan in Hainan, Sanya becomes the first city to cease production of solid clay brick in the province. 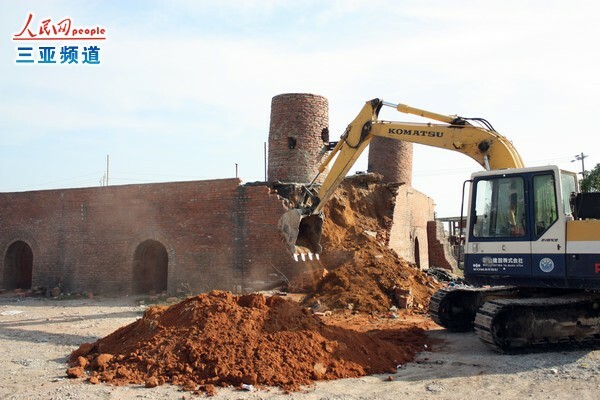 The removal of the last solid clay brick factory marked the end of clay brick production in Sanya. On December 10, mayor Wangyong attended the removal ceremony at Yongjinmei Village in Sanya. The campaign in and around the city included 15 brick factories, 17 brick kilns and their production lines. 135 million pieces of solid brick were eliminated, with an annual savings of 2.2 million tons of coal and 187 acres of conservation land. This is a vital step to make contributions for the construction of an international tourism island. The removal work has gained the relevant departments’ support and the brick factories also took a positive attitude coordinating with the government. The responsible person said that Sanya will do much work banning solid clay brick and to increase the development of new building materials, while encouraging old brick factories to convert their production methods to improve energy conservation and make a greater contribution for the better and faster social and economic development of Sanya.